AirPlay Media and Adventure Services, LLC. About AirPlay Media and Adventure Services, LLC. 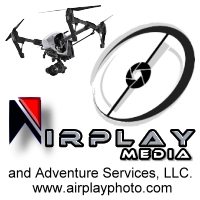 AirPlay Media and Adventure Services , LLC is a Roswell, New Mexico based company that legally specializes in the new and exciting world of Aerial Media with Small Unmanned Aerial Systems (sUAS, aka Drones). Our background extends back 18 years where the founder cut his teeth working as a professional skydiving Instructor and Photographer/Videographer following a twenty year career in the US Army. Still photography was our real specialty in the media world back then and that has grown and extended; to include work with video production, image editing, video editing and then the world of motion control timelapse. Today, we specialize in shooting professional still photography and aerial video using professional flying platforms and camera gear. Whether you are shooting a Hollywood movie, need images or video for real-estate sales, roof inspections, industrial inspections (wind turbines, solar arrays, oil and gas pipelines), construction, weddings, tourism, sales and advertising… the skies the limit!